Cyclists know how enjoyable it is to be on a bike, the sun on your face and the wind at your back while cruising down a tree lined street past all the cars stuck in traffic … ahhhhhh, pure bliss. However, cyclists also know about the dangers, inconveniences, tricky traffic patterns, and lack of bike infrastructure that make cycling in the HRM a bit of a challenge. HFX Cycle FIX is a project started by the HCC to help address these issues. The user-based map allows HRM cyclists to upload cycling issue reports. Reports can include any number of things – dangerous/confusing intersections, lack of proper signage, dangerous potholes/sewer grates, unfinished bike lanes, and any other obstacles that make your ride less enjoyable and less safe. 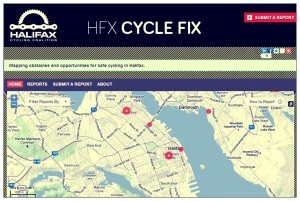 The HFX Cycle FIX map also allows users to contribute positive reports on preferred bike routes or suggested improvements, plus there is a “fixed” option for when a reported issue has been addressed. Additionally, multiple users can confirm that they agree with a report, signifying the scale of that particular issue. If your cycling with a camera or smartphone, be sure to snap a pic and then upload it to the site for others to see. There are two objectives of the HFX Cycle FIX. First, anyone can visit the site to upload a report and to view reports by others. Being aware of common “trouble spots” will only make your ride more safe. Plus, if you are new to cycling you can check to see which routes work for other cyclists and which do not. Second, as we collect data the HCC will use this information when setting priorities around cycling infrastructure requests and of course we will make this information available to the city. Do you have a cycling report to make? Visit the map at cyclehalifax.crowdmap.com. If you have any questions about this project you can email Matt at hfxcyclefix@gmail.com.